In the early state elections of 2012 in Saarland, the Pirate Party comprised 7.4% of the votes. For only the second time, they moved into a German state parliament. During the election campaign, they stood to benefit from many protest voters who were discontent with other parties. The parliamentary group is determined to harness this historical opportunity and to further strengthen their profile. At the beginning of August 2013, 13 deputies and staff members met for a retreat with the theme "Faction 3.0 – Starting over with Today's Knowledge." Their goal was to explore Design Thinking as a method of seizing suggestions from the population. In addition, they intended to develop a shared vision from individual opinions. Together with Daniel Bartel, I was invited to facilitate both days. Accompanied by theoretical background, the participants sprang into action from the very beginning. Within an hour, they passed through the whole design thinking process in the so-called wallet challenge. In the afternoon, participants dealt with their own issues in a deep dive. One group devoted itself to the question of how politics can support young entrepreneurs to realize their ideas. A second group addressed the topic of the "debt ceiling," which at that time was a big topic of the Saarland political scene. In conversations with founders at in the Startup Center at the University of Saarland and with passersby on the street, the parliamentary group gained empathy. This shift in perspective led to many new ideas. Selected ideas were made tangible in rapid prototypes to subsequently validate them with citizens. On the second day, we applied LEGO® SERIOUS PLAY® to form a shared vision from individual contributions. After two skills-building exercises, in which participants had the opportunity to familiarize themselves with the process of the exercises and the contents of the SERIOUS PLAY® starter kits, everyone was ready for the actual assignment: Illustrating their vision for the parliamentary group in the state of Saarland in 2017+ with LEGO bricks. This exercise ensured that everyone would have their say, and some very different perspectives emerged from it. Building on this process, it was surprisingly easy to combine the individual models, together with additional bricks, into a common vision in which everyone could find a place. Chairman Michael Hilberer with LEGO® SERIOUS PLAY® model in discussion with citizens. With the LEGO model, we drew a great deal of attention to our group at the St. Johanne marketplace in Saarbrücken. Many passersby stopped to ask about the model and what it meant. This resulted in many long, deeply probing discussions with citizens. The group then refined the vision on the basis of this feedback. More and more citizens feel misrepresented and wish for more influence in politics. In turn, politicians benefit from ideas of the population. Design thinking is effective in considering citizens' interests to a larger degree. Beyond ideology, this offers an opportunity to distinguish oneself from other parties based on values. 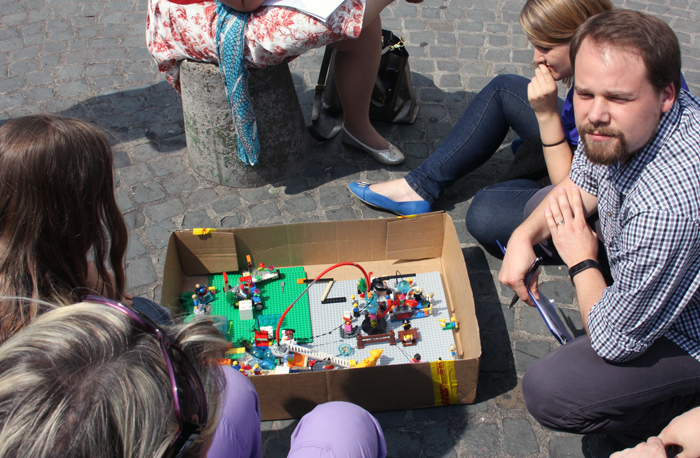 By means of prototypes and LEGO® SERIOUS PLAY®, political concepts become tangible. It came as a surprise how straightforward it is to get into a constructive dialogue with citizens with the help of such tangible artifacts. The parliamentary group of the Pirate Party in the state of Saarland was able to confirm, one month after the workshop, a significantly more open interaction in their daily work with each other. They are determined to anchor the newly-learned process in their collaboration. Until the regional elections in 2017, they have three more years to put across their vision for politics in this century.